Frontispiece and title page of the German Robinson edition of 1754 (detail). 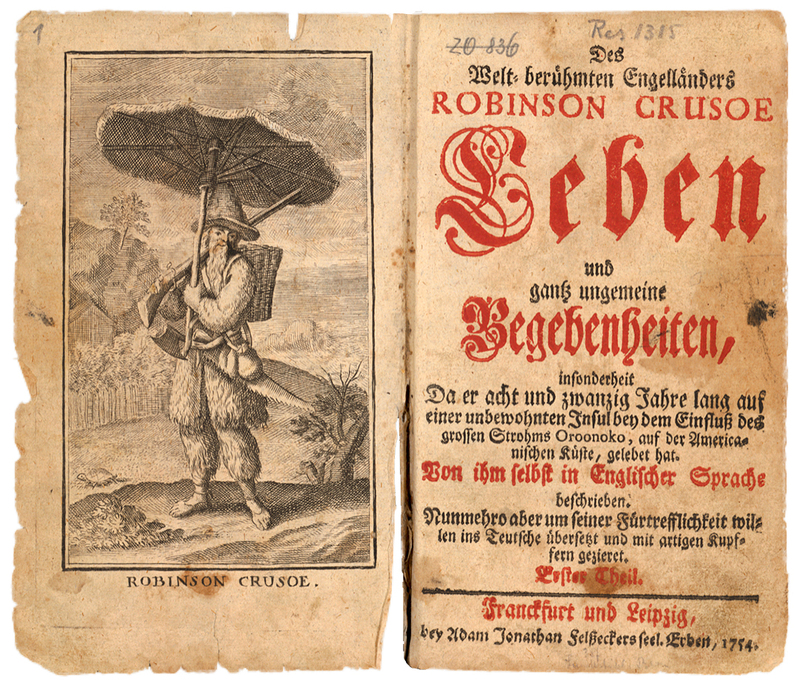 In 1720, not long after its publication, the first German translation of Daniel Defoe’s Robinson Crusoe came out. Zurich academic Johann Jakob Bodmer recommended it to the ladies of Zurich for reading. In 1818, a Kleiner Robinson zur Unterhaltung für die Jugend (Little Robinson for the entertainment of young persons) was published in Zurich. Bodmer’s book recommendation for women was found in his Die Discourse der Mahlern, a weekly publication designed in the English style. Reading matter for women was a new topic at the time. 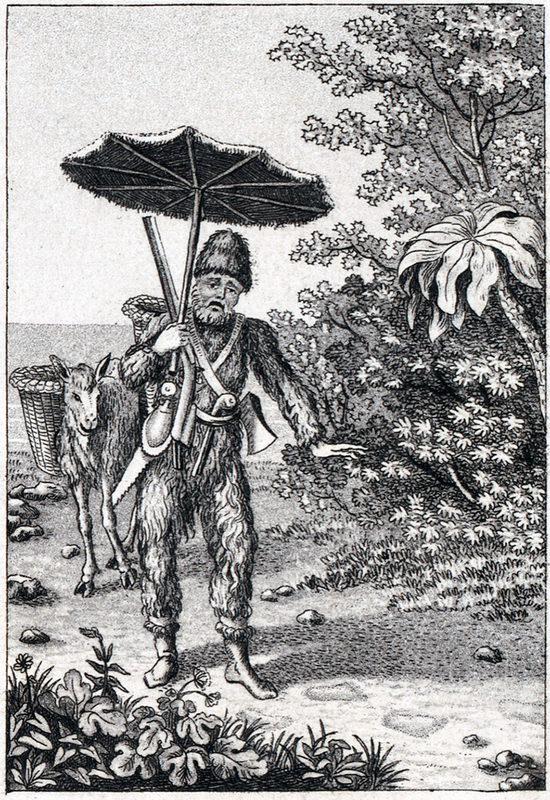 And Robinson Crusoe was one of the few contemporary books that Bodmer thought suitable for that purpose. Womenfolk should, after all, be rendered ‘witty and pleasant, but not learned and pedantic’ by the materials they read. About 15 years later, Robinson was published in Zurich for the first time in a child-friendly version. The novel came into the hands of gifted school dropout Salomon Gessner. Reading it prompted him to write his own Robinson stories. The punishments of his educators merely meant he needed to exercise more caution. Gessner, who went on to be a successful author, printer, publisher and first editor of the Neue Zürcher Zeitung, thus had the opportunity early on to practise dealing with censorship. Unfortunately, the Robinson texts by the young Salomon Gessner have not survived. All we know is that his Robinsons were all heavy smokers and that he loved to set the elements in turmoil. Gessner’s Robinson phase is early proof of the novel’s success as a children’s book, which was not as Daniel Defoe had intended. About 25 years previously, in his educational novel Émile ou de l’éducation, Jean-Jacques Rousseau recommended it as reading material for young people. 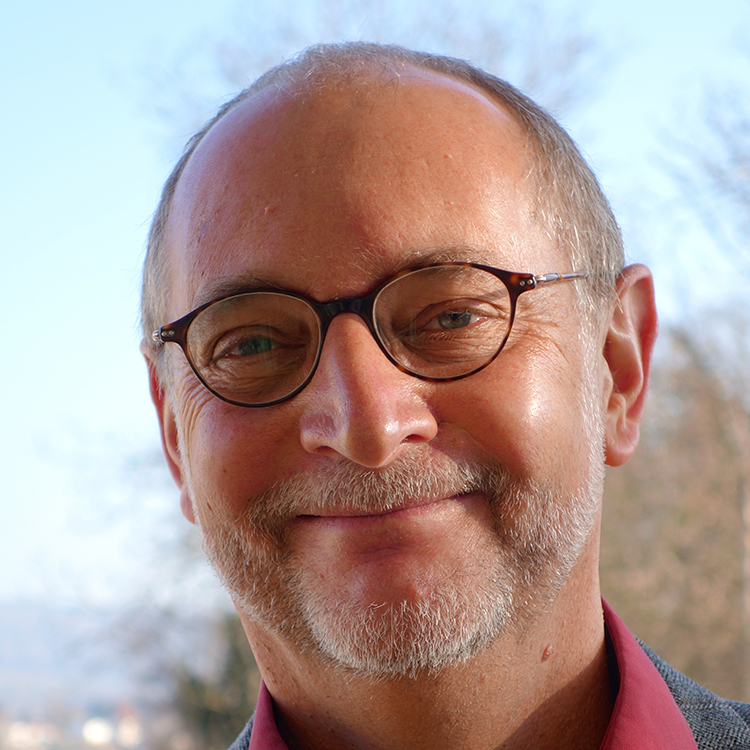 Anton Graff. 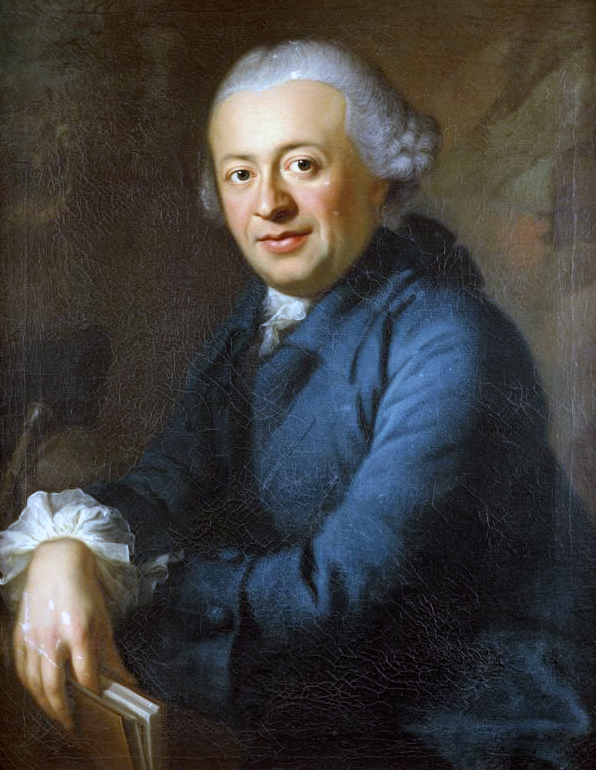 Portrait of Salomon Gessner. Oil on canvas. 1765/66. The encounter with Robinson also marked a turning point in the life of another well-known Zurich citizen. In 1777, unhappy Latin student Hans Conrad Escher, later von der Linth, was given the book to read. Appropriate children’s literature, Escher remarked later on, did not exist back then. All the more was he inspired by ‘the old Robinson Crusoe’ to passionately ‘build all kinds of Spanish castles’. In his Robinson fantasies, he recuperated from the impositions of his school lessons. ‘From that time on’, wrote Escher in his autobiography, ‘a new life emerged in me: all impressions were felt more vividly, all sensations were more alive…’ Robinson unleashed in his nine-year-old reader a real surge in creativity. ‘Des Welt-berühmten Engelländers Robinson Crusoe Leben’. Frankfurt and Leipzig, 1754. Frontispiece and title page of the German Robinson edition of 1754. According to Ludwig Meyer von Knonau (1769-1841), in those days Robinson and robinsonades were every bit as popular as the turn-of-the-century chivalric romance novels. There are a number of reasons for the novel’s huge success. Defoe’s new ‘reportage’ style gives an impression of immediacy and authenticity. Robinson is a modern man from a middle-class merchant background, who feels and thinks like others. The author lets him tell his adventurous story, ostensibly recorded in diaries, in the first person. Both big readers and small can identify with a hero such as Crusoe. In addition, travel and books, especially travel books, were among the great proclivities of the time. In the 1770s, in the Landvogtei Castle at Eglisau the little Ludwig Meyer von Knonau prayed to the good Lord that he might let the as yet undiscovered lands become known in his lifetime, and at the Apocalypse might spare a few of his favourite books. One of those favourite books was, of course, ‘the old German translation of the English Robinson Crusoe’. Ludwig Meyer von Knonau chose the reading material himself in his grandfather’s library. As regards his youthful reading matter, in which the robinsonades occupied a prominent place, he commented in retrospect: ‘These random readings of a boy and youth may displease some educators; I alone am convinced that if the intellectual sustenance had been portioned out to me by the hands of others, my curiosity and thirst for knowledge would not have been so awakened and I would have remained unacquainted with much that is remarkable’. This too links the little Zurich Robinsons of the 18th century with their hero: they help themselves. → Read in Part 1 about Daniel Defoe’s original version, and the Swiss adaptation that became a global success. Robinson’s departure from the island. The illustration served as a model for the same scene in the 1754 German edition of Robinson. Aquatint by Franz Hegi. 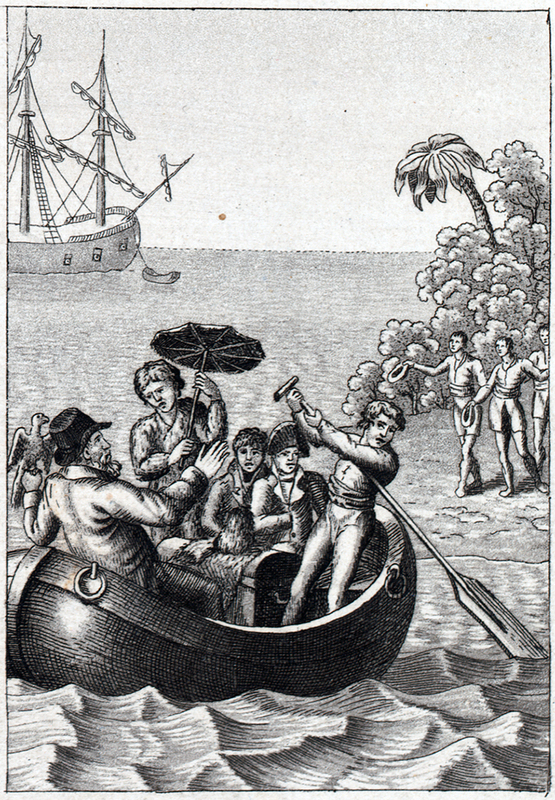 In: ‘Kleiner Robinson, oder Abentheuer des Robinson Crusoe zur Unterhaltung für die Jugend’ (Little Robinson, or the adventures of Robinson Crusoe for the entertainment of young persons). Zurich: Buch und Kunsthandlung Trachsler, 1818.